The “Age of X” crossover has been turning some heads for a few weeks now, and with good reason. As much as writer Mike Carey has crafted a fun and gripping vision of an alternate universe for the X-Men a lot of the credit goes to artist Clay Mann. His dynamic visual style has been an asset to X-Men: Legacy for some time now and he’s certainly upped his game for this storyline. He graciously took some time out of his busy schedule to chat with Nerdy Nothings about how he got started in the industy, his influences and more. Take a look after the jump! Nerdy Nothings: First of all, I was hoping you could give us a brief rundown of how you got started in the industry. Where did you get your first break, and what were some of the projects you worked on that you believe really helped you grow and find your footing? Clay Mann: I think my story is pretty much how Marvel or maybe DC will tell you how it can happen. Just get out there, build a portfolio and find editors at conventions. I think I was pretty fortunate because by the time I went to my first big show, there were a few people at Marvel who recognized my name because I would continuelly send very large pics, like 11×17 “postcards” with nothing but my name. So I very quickly had contacts, but as many will tell you… that’s just the start. I kept it all up until I met Joe Quesada and he really got the ball rolling for me. He was letting me practice with Painkiller Jane. I believe he’s the guy who put editor Warren Simons in contact with me. I just got a call one day along with an 11-page story in X-Men Unlimited and that was my start. As for projects that maybe helped me grow… I’d say all of them have contributed in some way. Each writer teaches you something and the same with each editor… so really, I’d have to say all of them. NN: How long have you been reading comics and what are some of your favorite artists, titles and story arcs? Who would you say has had a big influence on your art? CM: I’ve been looking at comics since I was in elementary school, I didn’t even care about story until much later. Whenever Generation X came out is when I really started to read and from there I was just in love with that series. Then they got sucked into “Age of Apocalypse” and I bought every tie-in. Chris Bachalo was a big influence, as well as Joe Madureira. Joe Madureira probably was the biggest influence. 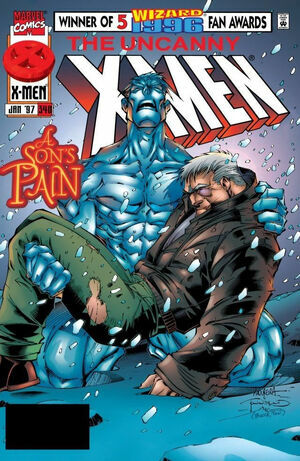 When I first saw the comic with Iceman holding his father on the cover, well … I never stopped buying X-Men until he left. Jim Lee, J. Scott Campbell, Art Adams… I have a lot of favorites. Also, I was heavy into some anime and manga. NN: Could you talk to us about some of your anime and manga influences? CM: In highschool anime was huge, there was a little ring of bootleggers, and we all past them around. I watched anything that wasn’t drawn too cute. Ghost in the Shell, Akira, Ninja Scroll, Fatal Fury, Appleseed… just anything in that style… sort of real, but not. NN: You first came to the attention of Nerdy Nothings with your work on X-Men: Legacy. How did your involvement on the series come about, and was working on an X-Men title an aspiration of yours? CM: I was at a point where I wanted a change. I had been on books such as Thor, Daredevil, Elektra… I just wanted something a little less heavy. I asked for a change and X-Men: Legacy was one of the offers. Working on the X-Men is something of a dream. Growing up wanting to draw comics, it’s sorta the “it” title… or it was for me. NN: The “Age of X” crossover—currently on the stands—looks like it could have a pretty big impact on the X-Men franchise. Did you feel any added pressure while working on these issues? Did this arc require more planning than usual from your perspective? In particular, there seems to be a lot of character redesigning required in any alternate reality story. CM: I didn’t feel the pressure at first but later I watched “Age of X” go from an idea to a big marketing push. “Age of X” did take more planning than anything I have ever done. I was asked to create the world of “Age of X,” it was a honor, but it did come with some worries of whether I could make people happy. NN:And what was your approach with redesigning so many classic characters for the Age of X storyline? CM: Once I imagined the world it just sort of fell into place. I get a lot of people wondering about the lack of shirts on guys, but I feel it’s realistic. I mean I really thought about it. If I was fighting all day, walking around on concrete… my shirt would be off. I was a roofer and I was a plumber before comics and guess what? I wasn’t wondering what to wear with my nailgun, it was hot and the shirt was off. NN: Do you have a favorite character to draw? CM: Well, that’s hard to narrow down. Rogue is my favorite female… but, I have a weird connection with certain characters. So she is hard sometimes, and when I say connection maybe I could describe it as the character is so specific or the idea of who they are is so strong in my head it’s hard to put it on paper easily. For instance… if I think of Superman, I see Christopher Reeve… if it’s not his face I’m drawing then it just feels wrong. NN: Throughout your body of work, what’s been your favorite project to work on so far? CM: X-Men: Legacy by far. Thanks again to Clay Mann for taking time out for us. Check out his blog here, also be sure to see him at the C2E2 show in Chicago this weekend, he’ll be in Artists Alley, table H10, as well as signing at the Marvel booth on Saturday from 3-4pm and Sunday from 11am-Noon.